He’s a natural, even though rainbows are considered a non-native species to Deep Creek. (Jim Burns). 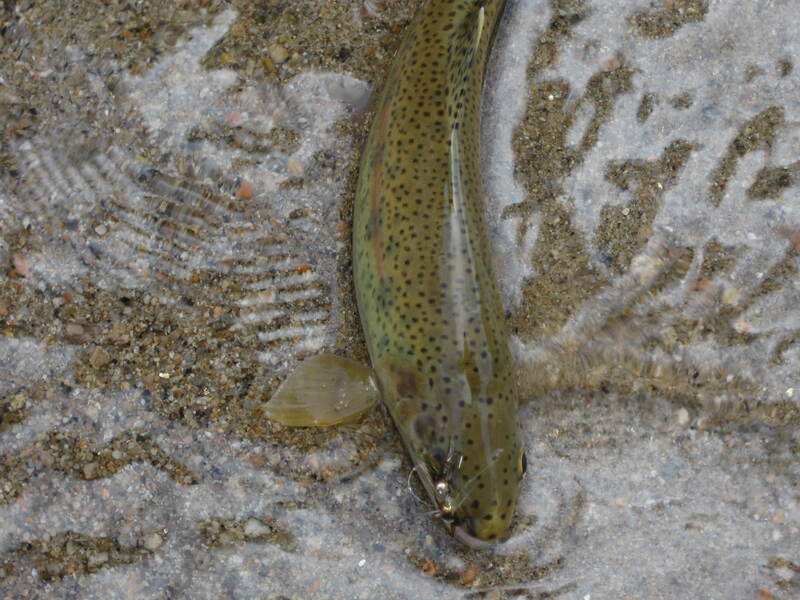 UPDATE: Take Deep Creek off your fishing radar until the drought ends. You’ll find little water and few fish. Also, because this is a protected area, if the native fish die out, that will also be the end of this once beautiful water because it won’t be stocked. Don’t add to their stress by catching them. With free time in hand, most fly fishers from Pasadena head for the West Fork of the San Gabriel, or roll the dice above the Jet Propulsion Lab in La Canada. 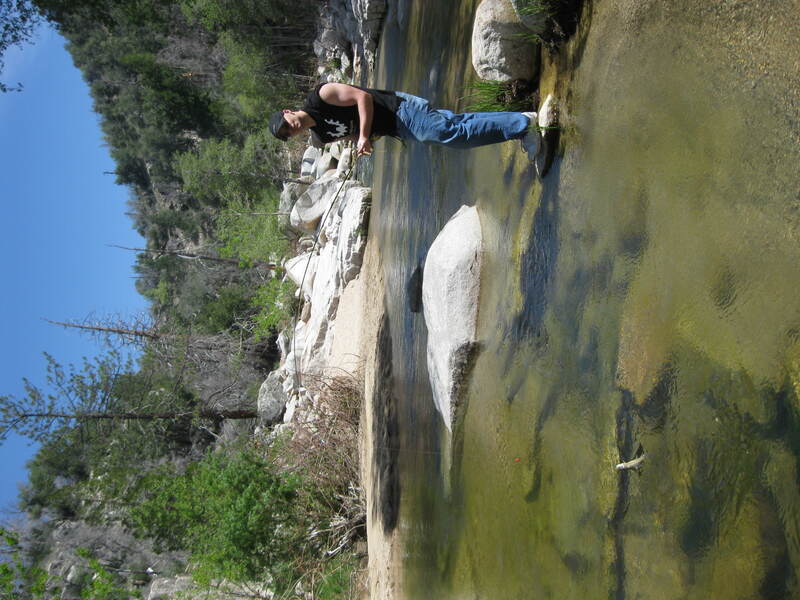 Why we ignore Deep Creek in the San Bernardino Mountains is a mystery. After all, it is a state-designated wild trout stream, meaning no farmed fish, only naturals. According to literature, it hasn’t been stocked by the Dept. of Fish and Game in over 30 years. Rainbows are the game; browns, the hope. The ‘bows on Deep Creek keep on fighting (Jim Burns). Will and I drove the quick hour and twenty minutes to Lake Arrowhead, getting into town in time for lunch. With an Adventure Pass in hand ($5 for a one-day; $30 for a year, available at Orvis on Lake; Sports Chalet or Big 5), we drove the additional 10 minutes around the lake until Hook Creek Road, which turns ugly for autos when it becomes 2N2GY, forest speak for dirt. If you’re not four-wheelin’, watch your oil pan. His FIT made it back to Pasadena, unscathed. Following the road down a gentle canyon, if you turn right, you’ll hit a concrete bridge with plenty of fishing opportunities, or turn left and you can walk to the confluence of Deep Creek and Holcomb Creek. The creek runs about 22 miles from its beginnings in the San Bernardinos north into the Mojave. Hikers can spend a fun day walking the Pacific Crest Trail, and, if energy permits, enjoy a dip in the Deep Creek Hot Springs (clothing optional). Last Saturday, the water temp was 57 degrees, while the sun warmed the air to 80 degrees. Dries weren’t happening, but the nymph action was ridiculous; hungry (wary) fish kept us guessing throughout the several hours we spent coaxing them out of the many holes and riffles on the creek. Great post, I saw your link over on the Kern River Fly Fishing Forum. From the sounds of it, the road is pretty rough toward the end. I have a Subaru so I’m assuming I couldn’t make it to the parking lot. Do you think I could get close enough to make it in reasonable walking distance to the creek? Yes, I would turn right after you’ve gone down the grade, then park and walk. There’s a turnout that overlooks the creek. From there, it’s maybe a 10-minute. walk. Good luck! i won’t sell to developers either. It was great while it lasted. I’m so glad you wrote this post, especially now, when I was feeling so low living in noisy Pasadena. Thanks for reading my post. I really have to stop crying and go back up there to see the place again. I’ve only made it once since the Old Fire 2003 and it’s still too painful. That’s why I obsess about Haha. Thanks for a great article. I am think of planning a visit to Deep Creek sometime in the next two months. Any recommendations for fly patterns? Is this a good time of year to go? I haven’t been there in a while, but you’ll want to bring small some small nymphs: I’ve had good luck with bead head Prince nymphs around 16 or 18. I’m not sure what you can expect after three years of drought, but you’ll have a good time regardless. Will be camping in may at Crab Flats and plan to visit Holcomb and Deep creeks. I am thinking about a trip in some time this year. Been hiking up there but not fishing. I am assuming late spring, early summer after runoff is best time. Ran into some guys near Mohave end. Said they didn’t catch anything. Thanks, Kevin. Anyone have any fish sightings on Deep this year?